THE REDS HAD TO COME BACK TWICE TO DEFEAT THE NATIONALS 5-4 ON SUNDAY. Francisco Cordero scares me like Freddy Krueger did when I was ten. Cordero blew his fourth game of the season on Sunday afternoon, but also managed to steal the win away from Bronson Arroyo. After the Reds came back for the second time during Sunday's game against the Washington Nationals in the tenth inning, Nick Masset recorded the second save of his career, and his first in the National League. The Reds defeated the Nationals 5-4 to win the weekend series, moved back into a tie for first place after a Cardinal loss, and salvaged the road trip going .500 in six games against the Cardinals and Nationals. After Bronson Arroyo's last start against the Cardinals (4.1IP, 10H, 7ER, 5BB), he was due to pitch the gem that he did. Arroyo went eight innings and allowed only two earned runs on six hits while striking out five. Arroyo always has his fair share of horrible starts each season, but his short term memory and professional demeanor usually propel him over his opposition five days later. Placing his last start behind him, Arroyo pitched well enough to receive the win, but left the game in the eighth inning trailing the Nationals 2-1. Attempting to award their teammate with a win, the Reds' offense put together three runs in the top of the ninth. With the National League's save leader Matt Capps (18) on the mound, Drew Stubbs doubled with one out. Pinch-hitter Jonny Gomes then doubled Stubbs in and pinch-hitter Scott Rolen hit his 14th home run of the season to make the score 4-2. Francisco "Coco Krueger" Cordero entered the game during the bottom of the ninth inning attempting to record his 17th save of the season. Cordero walked Josh Willingham to begin the inning. One out later Ian Desmond singled, both runners stole as Alberto Gonzalez struck out, and pinch-hitter Michael Morse tied the game with a double to right-center. “It’s always easy to do something again when you’ve done it before," Johnny Gomes said. "We’ve won some games in last at-bats. We know we have that ability." The spunky Reds wasted no time coming back. During the top of the tenth inning Jay Bruce and Lance Nix singled. Drew Stubbs then notched his third hit of the game with a two-out RBI single giving the Reds the lead once again. Nick Masset allowed a hit and a walk during the bottom of the tenth, but got the job done, as the Reds beat the Nationals 5-4. *Homer Bailey comes off the 15-day disabled list and could pitch. During the Cardinal's 4-3 loss to the Brewers on Sunday night, Albert Pujols hit a kid. 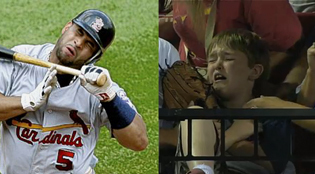 A young Cardinal fan poorly attempted to catch Pujols' sixth inning solo-shot, resulting in the line-drive home run catching him in the chest. Despite acquiring a spectacular souvenir, a fantastic bruise/story to go with it, and air time on ESPN's Sunday Night Baseball, the kid continued to cry. Like his favorite team, he complained. The Cardinals gave the kid an Albert Pujols bat as his father posed him for cell-phone snapshots instead of teaching him how to correctly catch a baseball. Watch the video here.